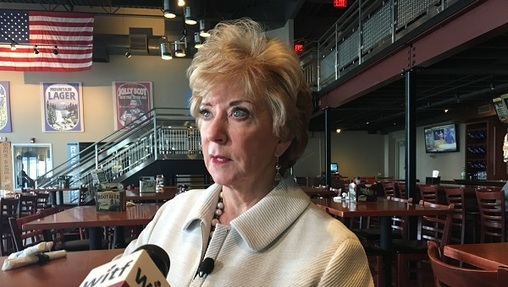 HARRISBURG, PA (WSKG) — Trump appointee Linda McMahon made stops in midstate Pennsylvania Tuesday to promote efforts the Small Business Administration is making to pump money to business owners. McMahon, who heads the SBA, visited the Appalachian Brewing Company in Mechanicsburg and Battlefield Leather in Gettysburg. She said she wants to show businesses how the SBA can help. The Brewing Company’s Mechanicsburg location, for instance, got part of its start-up money from loans backed through the administration. McMahon noted, private banks are more likely to give small businesses reasonable loans when the federal government guarantees them. “Most small businesses fail because they’re under-capitalized,” she said–adding, she’s pushing to expand the number of banks giving loans. Appalachian Brewing Company partner Artie Tafoya said the startup phase is generally the time when SBA assistance helps most. “Most small breweries now that are starting up–they almost have to [get federally-backed loans] because most of them don’t really come from the brewing industry, so they don’t really have the experience and the other things,” he said. McMahon said she’s also pushing to make individual tax cuts permanent–which could help businesses that report their profits as personal income. “I do think that is something that’s being very much discussed now,” she said. McMahon is best known as the cofounder of World Wrestling Entertainment with her husband, Vince McMahon. Trump appointed her to head the SBA last year.